The holidays are approaching fast, snow is falling (at least where I'm writing this from), shoppers around the U.S. are about to trample each other over a $5 waffle iron. Even though it is an incredibly busy time of year, it isn't too late to put together an awesome marketing campaign for your green industry business! Follow this step-by-step guide and reach more potential customers during the upcoming holidays. 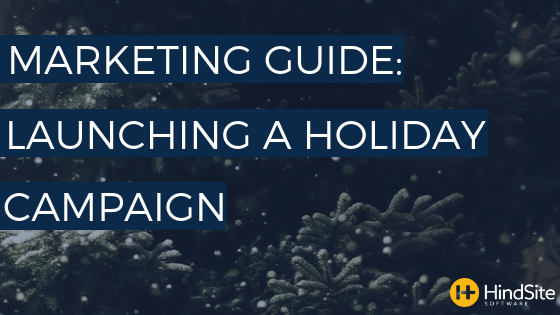 The first step in creating a holiday marketing campaign is to determine what your goals are. Are you trying to sell a different service to all your current lawn maintenance customers? Or is your goal to grow your client base by 5% through a holiday offer? It is important to decide what your focus is. Create S.M.A.R.T. goals for your campaign. Make sure they are specific, measurable, attainable, relevant and have a time-range in place. After you have your S.M.A.R.T. goals created, you will then want to start targeting who you are trying to reach with your campaign. Do you already have all the data you need to reach them? Are you going to be offering a percentage discount on your plowing service or maybe you are going to offer a free mow for any of your existing customers for a customer referral. Make sure it is clear and easy to follow. This is where you are going to decide how and when you will be sending out your marketing messages. Strategize how you are going to reach those goals you have set. Having an integrated approach and using all of these forms of promotion in conjunction with each other works best. If you’re using an emailing service like Connect, our service business marketing solution, it is simple to segment who you are going to be sending your emails to. Create a few emails that you plan on sending out, from your first email to last. If you plan on sending one at the start of December then have two more you would like to send out, decide what information you want to highlight. Write subject lines that will make the people receiving your email want to open it. A good rule of thumb for writing a good email subject line is to ask yourself “would I read this”? Then, you need to make sure your actual email is being read, too. Make it short, make it clear and use actionable language. Tell the reader what they should do! Are they clicking on a link? Are they supposed to call in and mention the email? Spell it out for them! Use your social media accounts to tell about your offer. If you’re offering a percentage discount on snow plowing, Tweet about it and post it on your Facebook page. We recently wrote about how to get Twitter working for your small business. In our post, we went over a few different ways to make Twitter more valuable to you. One of the best things you can do is to have a local focus. Create social media messages with your area in mind. For example, if your offer is 1 free plow for new residential customers, make sure your city is mentioned in the post. Schedule your posts in advance. You can do this with social media publishing and monitoring tools like Hootsuite (they even have a free version which works great). If you haven't started this yet, might be a little too late for this holiday season! However, direct mail should be a part of your promotional plan. Get a jump on it for next year. A campaign with multiple moving parts is more powerful than just using one of these methods. Now that you have everything planned out, it is time to get your offer in front of some new customers! Test out all the emails that you created to make sure they will look the way you want them to. Make sure you’re clear about what your offer is. Proof and then proof again, because offering 5% off a one time service is different than 50%! So what do you do after the holidays are over and your offer is up? Measure the results of your efforts! If you know a certain email resonated very well with readers (you can see many key metrics in Connect), document what you did and use it in your future emails. Try and reflect on why certain areas didn't perform as you hoped and make a plan to improve it next time around. Know what helped you reach the S.M.A.R.T. goals you set in the beginning of this process. Measuring what worked and what didn’t will be beneficial for your future marketing campaigns.